“We draw [Jesus] toward us the moment we begin to think of His Mother’s sorrows. He is beforehand, says Saint Anselm, with those who meditate His Mother’s woes. And do we not stand in need of power in heaven? What a great work we have to do in our souls, and how little of it is already done! How slight is the impression we have made yet on our ruling passion, on our besetting sin! How superficial is our spirit of prayer, how childishly timid our spirit of penance, how transitory our moments of union with God! We want vigor, determination, consistency, solidity, and a more venturous aspiration. In short, our spiritual life wants power. And here is a devotion so solid and efficacious, that it is eminently calculated to give us this power, as well by its masculine products in the soul as by its actual influence over the Heart of our Blessed Lord. Who, that looks well at the saints, and sees what it has done for them, but will do his best to cultivate this devotion in himself. …do not some of us feel that the world grows more attractive to us as we grow older? It should not be so; but so it is. This comes of lukewarmness. Age unlearns many things; but woe betide it when it unlearns vigor, when it unlearns hope! Rest is a great thing. It is the grand want of age. But we must not lie down before our time! Ah! how often has fervent youth made the world its bed in middle life! and when at last the world slipped from under it, whither did it fall? If we live only in the enervating ring of domestic love, much more in the vortex of the world,we must live with Jesus in the spirit of Mary or we are lost. Let us learn this in increased devotion to her [sorrows]… and it will become in us a continually flowing fountain of supreme unworldliness. Torpor will become impossible. Oblivion [forgetfulness] of supernatural things will become unknown. We shall feel that rest will be present for a while; but we will disdain the temptation [to flee from the cross]. Mary will teach us to stand beneath the cross…. He who is growing in devotion to the Mother of God is growing in all good things. His time cannot be better spent; his eternity cannot be more infallibly secured…. And there is nothing about Our Lady which stimulates our love more effectually than her dolors [sorrows]” (Emphasis added). Edited and slightly adapted from The Foot of the Cross: The Sorrows of Mary, pages 68-73, by Father F.W. Faber (TAN Books). Father Faber, a convert, was one of the great spiritual writers of the 19th century. P.S. The Seven Sorrows of Mary are: 1) The Prophecy of Simeon; 2) The Flight into Egypt; 3) The Three Days’ Loss: 4) Mary meets her son with the cross; 5) The Crucifixion (Mary at the foot of the cross); 6) Jesus is taken down from the cross; and 7) The burial of Jesus. The devotional booklet I use and recommend is: Devotion to the Sorrowful Mother (TAN Books). 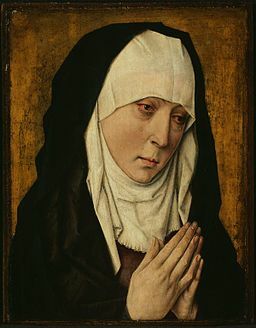 The Feast Day for Our Lady of Sorrows is September 15.